Flavius Theodosius, was born in Spain about 346. 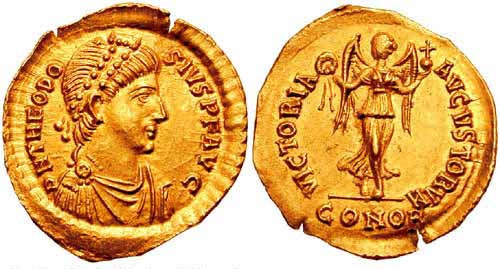 He was the son of the general Theodosius who stored Britain to the empire, and was beheaded at Carthage in the reign of Valens, 376. He was proclaimed Emperor after the death of Valens, who fell in battle against the Goths. Theodosius died at Milan, four months after the defeat of Eugenius, on the 17th of Januray, 395.